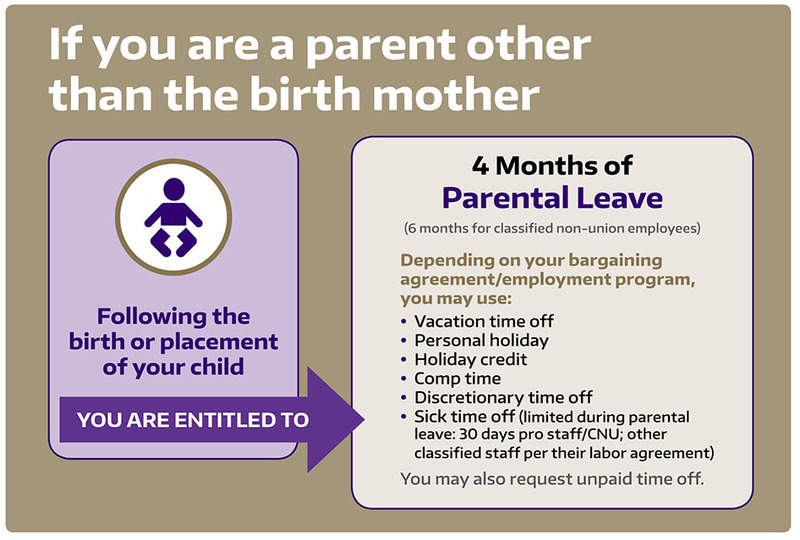 The University of Washington provides parental leave for all monthly paid professional and classified staff — mothers and fathers, birth and non-birth parents — regardless of how long they have worked here. You may take parental leave even if you are not eligible for FMLA. If you qualify for FMLA, your parental leave and FMLA will run at the same time. If you have not used up your FMLA entitlement as of the first day of parental leave, then all or part of your parental leave may be designated as covered by the FMLA. Contact your HR leave specialist if you have any questions about parental leave. Your employment program determines the amount of parental leave time you may take to bond with your newborn or newly placed adopted or foster child. Parental leave is usually approved as one continuous period of time. It is not counted in days or hours; it is a 4 or 6-month period, during which a parent can take a leave of absence to bond with their child. However, with departmental approval, you may be able to work intermittently or request a modified work schedule. Most parents take parental leave when the child arrives. However, you may take your parental leave any time during the 12 months following your child’s birth, adoption, or placement. In addition to parental leave, if you are pregnant or are the birth mother, you are also eligible for temporary pregnancy and childbirth disability leave for prenatal and postpartum medical needs, including postpartum recovery. You may also have the option to take unpaid time off. Beginning July 1, 2018, the shared leave program is available to employees who are sick or temporarily disabled because of a pregnancy-related medical condition or miscarriage, and for parental leave. If your leave is covered by FMLA, the University will continue to pay its employer portion of your health insurance. You will still be responsible for any portion of your health benefits that you normally pay. Once your 12 weeks of FMLA is exhausted, if you are absent from work for a full calendar month, you must remain in pay status for at least eight hours that month in order for the University to continue paying its portion of your health insurance. Use at least eight hours of accrued time off (sick, vacation, discretionary, or compensatory time off; holiday credit; personal holiday; or shared leave per month to maintain benefits. This is known as “interspersing.” You are allowed to intersperse while you are on approved disability or parental leave. Employees are encouraged to apply paid time off on the first work day of the month in order to continue benefits for that month. If you are absent an entire calendar month without being in pay status, you will need to self-pay (in other words, pay both your and the University’s portion) to keep your health insurance coverage. If you have UW health insurance, you can add your new dependent child to your coverage. You continue to accrue vacation and sick time off if you do not take more than 10 days of unpaid time off in a calendar month. If you do not meet the requirement above, the holiday will be designated as unpaid time off. Request the entire period you would like to take parental leave in Workday (see Leave of Absence – Sick/Injured or Becoming a Parent User Guide). Request time offs (sick, vacation, unpaid) for each day of your parental leave in Workday. If you will run out of accrued time off during your parental leave, you may request shared leave. Request parental shared leave for the entire period you would like to take parental leave in Workday. If you receive donations, you may use them once your accrued sick and vacation time off balances are at or below 40 hours. Medical centers staff: Request parental leave by following your department’s usual leave request procedure. Two weeks before you are scheduled to return to work, contact your supervisor to discuss your department’s return-to-work process. To help with your transition back to work, UW WorkLife offers information on child care options and University lactation stations. Confirm that the employee has followed the procedure for requesting leave/time-off and submitted a completed health-care provider certification form to your HR leave specialist. Contact the employee within two weeks of their return date to discuss the return-to-work process. If you are unable to reach the employee, speak with your HR consultant or HR leave specialist. Contact your HR consultant or HR leave specialist if the employee requests a leave extension, reduction in hours, or change in job duties. Contact your HR leave specialist.